EPC Group’s advisory services cover a wide range of technologies and business challenges. Our proven methodologies provide for a strategic and flexible delivery model that is then tailored to address the specific needs of your teams, partners and stakeholders. We serve as an extension to your organization’s existing internal IT expertise and work closely with you to ensure your technology initiatives are designed, implemented and administered in a proven and scalable manner. 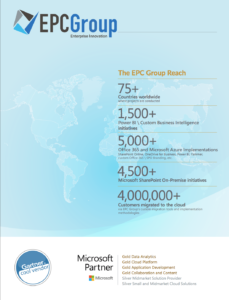 Whether you are a small-to-midsize business implementing SharePoint or Office 365 on your own or a global enterprise organization currently conducting internal “whiteboarding” sessions around business intelligence (BI) for mission critical data, EPC Group can immediately step in and engage with you and your teams to develop a clear and defined end-to-end plan for your specific requirements. We provide specialized skillsets and services focused on your business objectives and work with you to review your technology roadmap as well as any future plans and strategic initiatives to ensure no stone is left unturned. Strategy and design services for cloud-based infrastructures covering Office 365, SharePoint Online, Microsoft Azure, Amazon Web Services (AWS), Visual Studio Online, Team Foundation Service, Dynamics CRM Online, Office Online, Yammer and Microsoft Project Online. In today world, businesses of all sizes struggle with the rising cost to build, maintain and upgrade the capabilities of their IT departments and the services they provide. Fortunately, there are more technology capabilities and tailored alternatives available than ever before. EPC Group’s advisory services are ready to help guide your organization by leveraging our 15+ years of experience from over 2000+ projects as well as our vigilance in becoming well versed, certified and industry leading experts in the latest technology offerings across a wide variety of platforms (public, private and hybrid).